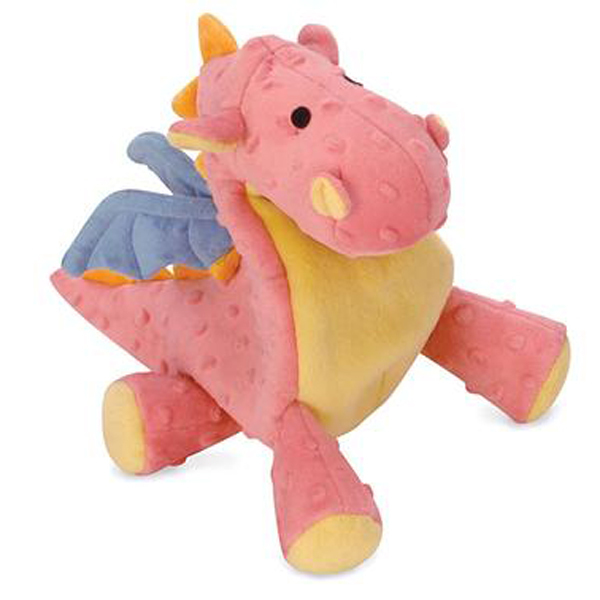 This soft goDog® Dragon Dog Toy will be your dog's newest friend who he wishes was real. This cute Dragon Dog Toy by goDog will be a blast for you and your dog. Your dog can play with this toy alone or you can join in and play a game of fetch with them! 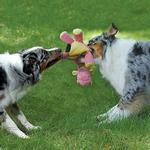 Minimal stuffing gives these toys a fun "floppy" feel that dogs love! The Dragon Toy by goDog is made with Chew Guard Technology. Chew guard technology is a manufacturing process that adds a super tough, durable liner to soft plush toys. The Chew Guard is lining specially engineered to withstand tough play. All seams are double stitched and reinforced. Your dog will love this goDog Dragon Dog Toy in Coral! It's perfect for cuddling, tossing, and mouthing. 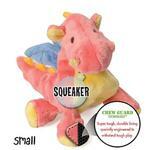 Size Small features a squeaker. Size Large features a grunter. goDog Dragons Tough Plush Dog Toy - Coral Customer Photos - Send us your photo! Most stuffed animals are too big for Sky, which is to be expected – he is a Maltese, after all! Thanks, Baxterboo, for having so many miniature plush toys like the Baby Dragon that are a perfect match for my small dog. When Sky is not carrying these “friends” in his mouth, he likes to snuggle against them. Lillie Loves all of her toys! Posted On 05/11/16 by Cynthia J from , CA Yes, Cynthia J recommends this product! My puppy loves this toy and I like the fact that there is no stuffing for the puppy to pull out. Posted On 03/29/16 by Nicole E from Bayport, NY Yes, Nicole E recommends this product! This toy stands up to our tough chewer so far and it looks so cute. One of her favorite toys! Posted On 11/10/13 by Michele W from , NY Yes, Michele W recommends this product! We like this guy~he's pretty tough to take out! At beginning of order there is an option to sign in or check out as a guest. I did not see an option to register. The dog I am ordering for doesn't like to wear clothes but will wear halters so love the halter dress options! Lots of amazingly cute stuff. I would have bought more but this isn't even my dog!